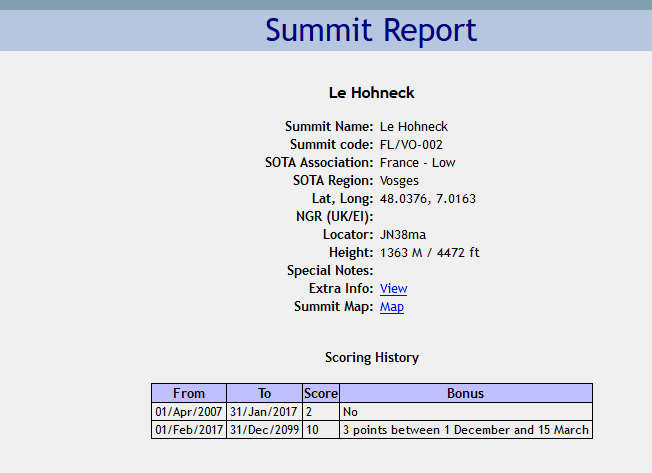 How can SOTAWatch indicate two different points values for the same summit? 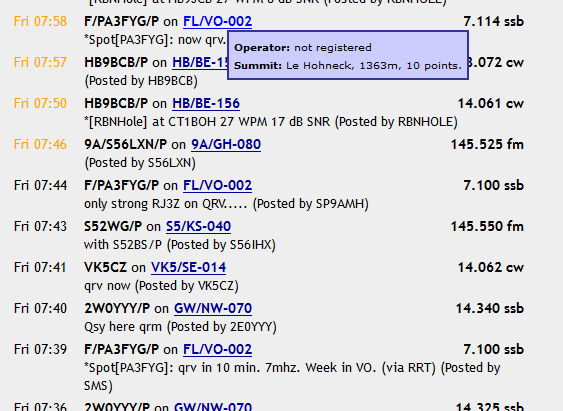 2 points for Hans and Chasers at 07:44 UTC and 10 points at 07:58 UTC for the SAME SUMMIT FL/VO-002. The answer today is the same answer that has been given previously. If you look closely, you’ll notice that one of the spots is direct into this system - that has the correct points value. The other is via a 3rd party app, which is looking up against out-of-date data. Users of that app should perhaps lobby its author to update/improve it. In any case, the official SOTA online resources are correct and up-to-date. It’s external stuff over which we have no control (other than perhaps blocking anything that causes a major problem - which I don’t believe this is) that isn’t. No it’s the other way around Tom. The ones from RRT (at 7:39 and 7:58) are the ones indicating 10 points as the database says it should be. The one that has been entered directly in SOTAWatch (at 7:44) is the one with 2 points - i.e. the wrong data. It looks like Sotawatch is looking at the old pre-FL summit list? I’ve dropped Jon a direct email. I know there is a plan for all of this to change, so I hope this is something simple. As you say Tom, the DB isthe “bible” when it comes to what is correct. 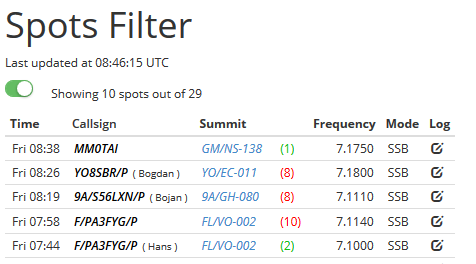 Jon GM4ZFZ has kindly said he is going to look into this in the next few days, when he gets a chance.